The new Unilink bus fleet represents a significant investment of £7million. 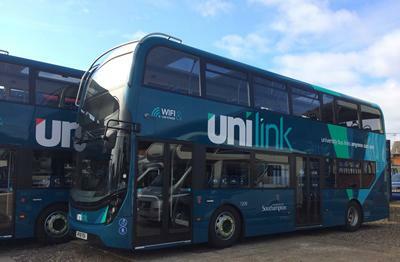 The University of Southampton, as part of a recently renewed partnership with bus operator Bluestar, has launched a brand new Unilink bus fleet. The £7million investment has ensured 32 state-of-the-art new British-built double-deckers will replace the University’s existing Unilink buses on the streets of Southampton. Each of the vehicles has a smart new look and sports the latest Euro 6 low emissions engine - the newest and cleanest standard for diesel. They also comply with the city’s Clean Air Zone targets set to be introduced in 2019. “Unilink has been a real success for the University,” said Professor Rachel Mills, Dean of the Faculty of Environmental and Life Sciences at the University of Southampton. The University launched its Unlink service back in 1998 to help link together our various campuses and to enable students to move easily around the city. In 2001, the University created Unilink as a company in order to invest further in this important service along with a partner to help us provide it. Unilink buses link the University of Southampton’s campuses around the city and are highly popular with the public as well as with University staff and students, carrying over 5 million passengers each year. Moreover, Unilinks support to the University’s students and staff has been recognised with nominations in the Times Higher Education awards and Green Gown awards, for its contribution to the community and to benefitting society in the city thanks to its commitment to cleaner air, respectively. Andrew Wickham, Managing Director of Bluestar, added: “As well as being far kinder to the environment - complying with Southampton’s Clean Air Zone targets being introduced in 2019 - these impressive new Alexander Dennis E400 MMC double decker buses have a fresh new look. They include glass roofs, creating more light for passengers travelling upstairs, as well as on-board technology like free WiFi USB charging points and contactless payment facilities. The Unilink partnership between the University of Southampton and Bluestar began in 2008, transporting staff and students across the city’s teaching sites and halls of residence. Now its services are now used by passengers from all walks of life.